No architect can rebuild a cathedral of another epoch embodying the desires, the aspirations, the love and hate of the people whose heritage it became. Therefore the images we have before us of monumental structures of the past cannot live again with the same intensity and meaning. Their faithful duplication is unreconcilable. Holy Trinity Cathedral in Boston occupies a fairly unique place in the history of Orthodox architecture in the North American Metropolia. Built in the years preceding the granting of autocephaly to the Orthodox Church in America, it is in many ways a testament to the attempt of the descendants of the Russian mission to express their emerging American Orthodox identity in the context of broader American culture. The history of church architecture in America reflects in wood, brick, stone and concrete the turbulent history of the establishment and development of Orthodoxy in America. The first missionaries in Alaska began by resorting to the tradition of house worship of the early years of Christianity, establishing chapels in houses of the Russian American Company and later, as the mission expanded, in homes of the converted native Alaskans. The first church buildings naturally repeated the architecture of the northern Russian wooden churches. As the mission moved its headquarters into the mainland, first to California and then to the East Coast, it carried with it the same tendency to construct its houses of worship in the image and likeness of churches of its homeland. Monuments of that time include the original Holy Trinity Cathedral in San Francisco and St. Nicholas Cathedral in New York, among others. However, with the influx of the immigrants from Eastern Europe and Western Russia in the first decades of the 20th century, the establishment of the new parishes far outpaced the ability of the immigrant groups to finance construction of the new churches. Everywhere in the United States Orthodox parishes had to rely on the hospitality of neighboring Christian communities. Borrowing space for worship in the Episcopal, Congregational and other churches often led to purchasing these buildings followed by intense modifications to accommodate Orthodox liturgy and to make them look more “Orthodox”. More often than not exterior changes were limited to the addition, usually highly incongruous, of onion domes. Most of the work done in the interior space where iconostases, panikadila, and other Orthodox interior decorations and appointments were added, often created a curious transition from a customary Protestant exterior to a fairly familiar Orthodox interior. Around that time, however, a decidedly non-Orthodox element of interior space established itself in many Orthodox churches: the pews which were the legacy of the “previous owners”. In the early years of purchasing non-Orthodox structures the pews were removed so as to imitate the open and more functional liturgical space of the home parishes. But as the immigrants became more assimilated into the American mainstream, the pews began to become a familiar fixture of American Orthodox Churches. Orthodox “decorating” of those “foreign” buildings usually reflected the prevailing taste of one or the other ethnic group, which is why the ethnic legacy of the Orthodox immigrant communities can be easily traced by the Carpatho-Russian, Ukrainian, Northern Russian or Vladimir shapes of their onion domes. Interestingly enough, westernized Orthodox architecture of post-Petrine Russia made little mark on the architecture of the American Metropolia. Nostalgia focused on the images of pre-Petrine structures. Where new churches were built from the ground up, with some capital to spare, their design strove to repeat the familiar lines from clean whitestone Vladimir/Suzdal ancient churches to the architectural richness of Russian and Ukrainian baroque. Unfortunately, nascent development of new architectural thinking which began in pre-revolutionary Russia and which carried great potential for the architectural development in the Metropolia was arrested and squashed by the October revolution. For the multitudes of Russian and Eastern European exiles, there was hardly any question of the need for establishing American Orthodox architectural identity. Their desire was for romanticized traditional church architecture. Post-revolutionary immigrants reacted with sometimes violent disdain to the proliferation of cheaply constructed Orthodox churches in America which utilized, like St. Gregory the Theologian Church in Wappinger Falls, NY, or St. Stephen Cathedral in Philadelphia, PA, typical “one size fits all” church blueprints prepared by American architects with minimal Orthodox “customization”. One of the most vocal critics of the disparity and lack of vision in American church construction was an immigrant architect from St. Petersburg Roman N. Verhovskoy. Verhovskoy was a curious figure. A graduate of the Imperial Russian Academy of Art in St. Petersburg, Verhovskoy aspired and eventually succeeded in establishing himself as the official Architect of the Russian Metropolia. He vehemently believed and professed that Orthodox architecture in America had one purpose only, that of being the face of the Russian people in America. In the words of his manifesto, “The church is the face of the national soul (spirit) of each nation. Only persons deprived of the deep feeling of their national dignity and self-respect (personality) go toward other foreign people to beg them for their “face” – image (project) of their own church, i.e. of their own spirit, their own religion. As a result, the foreign, outside world considers this kind of people as being a “lower race” (emphasis in the original). In the course of his long career in America, Verhovskoy was tireless in his violent criticism of any Orthodox church architecture which deviated in any way from what he considered the “golden standard” of Russian Orthodox church building. The “golden standard” was, not surprisingly, his personal vision, which, judging by several surviving churches and drawings of unbuilt edifices, was a romanticized and somewhat modernized version of Vladimir style, on par with the explorations of the great Russian architect Alexei Shchusev but nowhere near as elegant or sophisticated. In fact, the analysis of his archive demonstrates that he sought to legislate his oversight over every single architectural design in the Russian Metropolia, and took as personal offense every project which was undertaken without appealing to his expertise and advice. In spite of such active campaigning for himself, his legacy includes only a handful of churches, several iconostases and an unrealized project for an All-American Cathedral which was intended to be built on the site of the present Second Street Cathedral of Holy Virgin Protection in New York. In conflict with his repeated statements that only national architects should build national churches, he undertook two projects for the Greek Archdiocese and even a Buddhist temple. Never was his criticism so vitriolic, however, as when the offending architect was striving to explore the vernacular legacy of American architectural landscape and develop the archetypes that would go beyond the repetition of familiar ancient forms from the “old country”. His comments on those projects are not for the faint of heart to read. One of his favorite targets, perhaps due to his practicing in the vicinity of Verhovskoy’s own studio in New York, was a Boston architect Constantine Pertzoff. Constantine A. Pertzoff was also a White Russian immigrant from a similar background as Verhovskoy, yet being some years Verhovskoy’s junior, his formation as an architect occurred in his new homeland. He was a graduate of Harvard Graduate School of Design at the time when austere Bauhaus Modernism brought from Germany by Hitler’s exiles was triumphantly conquering the minds of young American architects. He went on to become a friend and colleague of one of the greatest Bauhaus architects Walter Gropius, the founder of the famous Boston office of “gentlemen architects” from Europe The Architects Collaborative (TAC). His professional legacy includes several houses, his own among them, in the Modernist colony in Lincoln, MA, a fairly well-known 1944 master plan for the redevelopment of Manhattan, and a small but interesting collection of writings, especially notable for his forward-thinking notions on sustainable architecture. By virtue of being a parishioner of Holy Trinity Cathedral, in 1948 Pertzoff received a commission for the design of the new cathedral on Park Drive, which led to at least two more known church projects in Ansonia, CT, and Waterbury, CT. The church of St. Nicholas in Whitestone, NY, designed by Sergey Padukow, who became a successor of sorts to Roman Verhovskoy as the spokesperson for the architecture of the Metropolia, exhibits interesting parallels with the design of Holy Trinity. Unlike many of his compatriots, Pertzoff had been so successfully assimilated into the American society that in 1937 he married Olga Monks, a niece of Isabella Stewart Gardner, in a three-stage ceremony which included two religious services (one in Holy Trinity Cathedral presided over by Fr. Jacob Grigorieff, and one in a Episcopal Church) and a reception in the Gardner palazzo across the park from the future site of the new cathedral. According to family history, this connection proved highly advantageous to the Holy Trinity parish when in the 1940s Fr. Theodore Chepeleff and his son Valentin were crisscrossing Boston in their search for a site for the new cathedral. Apparently the family of Pertzoff’s wife had assisted the parish in their negotiations for the site at 165 Park Drive which resulted in the purchase price of $17,000, considerably lower than the 1948 going market rate in the neighborhood. According to parish documents, Pertzoff, in addition to being the architect for the new cathedral and its iconostasis, was also one of its most significant donors, which allowed him to exercise considerable freedom in making decisions and wielding significant power in his relationship with the cathedral building committee. Signing of HTOC construction contract, 1950. Walter Gorelchenko, AJ Martini, Fr. Eugene Survillo, Dmitry Bogach, Constantine Pertzoff. The design and erection of the new Holy Trinity Cathedral was truly a fruit of the long and laborious “penny collection” among the parishioners, a term coined in the early years of the Metropolia to signify participation by all members. 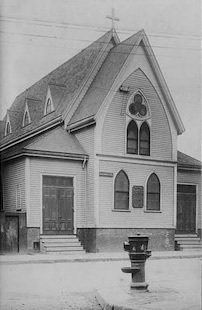 Initially the parish bought a building in Roxbury from the Congregational Church. Funds for the new building started to be collected at least as early as mid-1930s, but collections were slow and accompanied by much internal controversy. The arrival of Fr. Chepeleff in 1941 gave a new boost to fundraising efforts. Fr. Chepeleff’s considerable fundraising talents resulted in the rapid growth of the building fund, although large donors were still few and far between. The groundbreaking ceremony, presided over by Bishop Dmitri (Magan) of Boston and Fr. Chepeleff took place on September 25, 1949, but parish documents from as late as November of 1950 record that construction could not start until at least 75% of the bid price of $119,000 could be guaranteed. In 1950, in the midst of considerable controversy, Fr. Eugene Survillo replaced Fr. Chepeleff as rector of HTOC. The ensuing strife between parish factions further complicated financial issues. At the parish meeting in July of 1951 Bishop Dmitri took matters in his own hands and called on each member to stand up and say how much they were going to give or lend towards ongoing construction. Meeting minutes record each and every name and amount. Donations were primarily around $50-$100, with a single pledge of $1,000 and one $500 loan. In spite of all the trouble, the first part of the building which is now D’Arbeloff Hall was completed by 1952 and consecrated by Bishop Dmitri on February 3, 1952. By 1956, the construction bills in the amount of $167,000 had been paid, but some $200,000 still needed to be collected to pay for the construction of the second and main floor. A major fundraising effort was started in 1957, but eventually it became clear that the necessary funds were not going to be collected quickly enough, and a decision was made in 1959 to take out a $100,000 mortgage for 10 years to finance the completion of construction. In 1960 an additional $25,000 were added to the mortgage. The construction of the upper structure of the cathedral began in 1959, and on October 16, 1960 the new Holy Trinity Cathedral at 165 Park Drive was consecrated by Metropolitan Leonty and Archbishop Ireney of Boston and New England. The consecration was attended, among others, by Bishop Valerian of the Romanian Diocese and Princess Ileana of Romania3 who was apparently one of the Cathedral’s most significant benefactors. Due to lack of additional funds, the construction of the iconostasis did not begin until at least 1968. The original design called for painted icons, but subsequently a decision was made to create mosaics and commission them from Baron Nicholas B. Meyendorff, an iconographer residing in Vienna, Austria. Special collections were taken to cover the cost of each mosaic icon. In June of 1969 Nicholas Meyendorff unexpectedly passed away, and the mosaics that had already been started were completed by his daughter Helen. Ten out of the planned twelve mosaics of the Apostles were eventually completed and installed. Architectural design of Holy Trinity Cathedral on Park Drive was completely unique in the fabric of Orthodox architecture, American or otherwise. Pertzoff attempted to synthesize his knowledge of traditional Russian ecclesiastic architectural forms (cruciform, barrel vaults) with the motifs of New England ship design, whereby the structure of the building employed glued laminated wood beams as barrel ribs and wood planking as its skin, evoking the imagery of a ship’s hold which refers both to seafaring traditions and to the ancient Christian image of church building as a ship. Pertzoff’s Modernist foundation is evident in the simplicity of the main volumetric solutions as well as the use of light yellow brick which, in contrast to the traditional Boston red brick, was a very popular Modernist material of the day. In a rather charming nod to his Modernist friends, Pertzoff used the same pendant light fixtures in the cathedral hall and wall sconces in the nave that had been used by Gropius in his projects at Harvard Law School and his own house in Lincoln. Panoramic view of the nave. Photo by Christopher Smith. Whether this synthesis was completely successful is a matter of opinion. It seems that in his church projects Pertzoff usually achieved better results in his design of interior spaces. The cruciform barrels of the Holy Trinity Cathedral, completely uninterrupted due to load bearing structural properties of laminated wood, form a glorious open space which bestows the feeling of awe and the soaring of the spirit on a newcomer. The use of natural wood allows for a more intimate feeling of the space than would be presumed by its physical size. The abundance of natural light and the placement of the windows afford a dynamic and sometimes mystical quality to the space which enriches the experience of liturgical services. The absence of interior divisions in the nave, save for the iconostasis which separates the main space from the sanctuary, conveys the “oneness” of the church community in the celebration of the Liturgy. The exterior form of HTOC is viewed by some as lacking in proportional development and exhibiting evidence of the difficulty of synthesizing disparately different architectural traditions. The main cupola had been redesigned several times in the course of the design process and the original “space-age” form was replaced in 1994 by a more traditional Ukrainian baroque onion dome, which resolved the practical problem of leaking but did not help alleviate certain stylistic confusion. Regardless of matters of personal taste, Holy Trinity Cathedral is recognized as a Boston architectural Modernist landmark and is featured as such in the American Institute of Architects' Guide to Boston (in an entry which also mentions the installation of Bishop Nikon as the ruling bishop of Boston and New England at the HTOC in 2005).